Today, I’m sharing aA DigitalART Favorites 7/7. 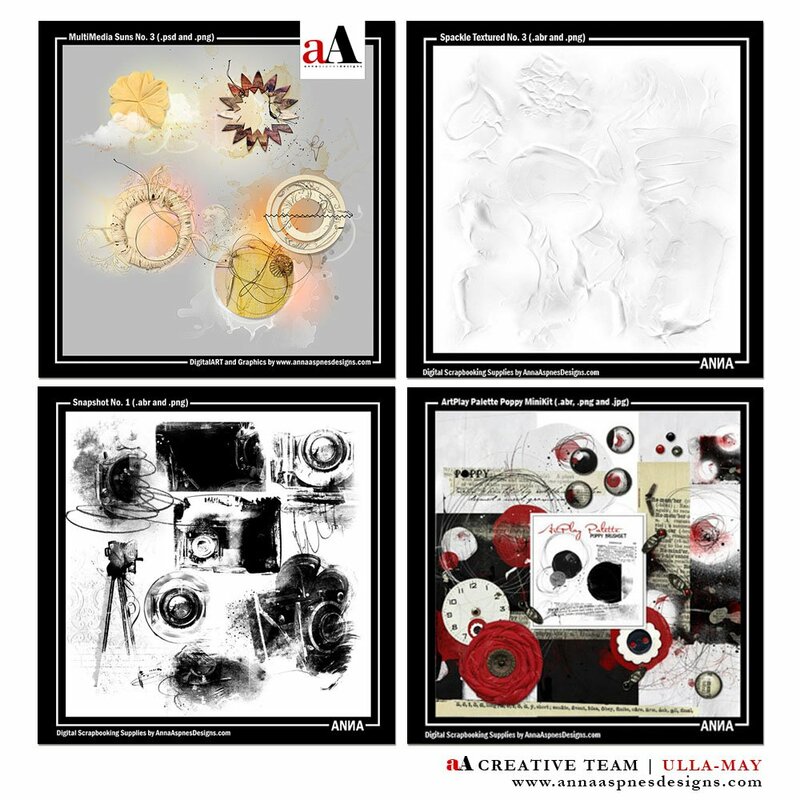 Today is post 7 of 7 in which the aA Creative Team to narrows down their favorites to just 4 products. In this LAST post of the series, I am sharing MY own top 4 aA DigitalART supplies. Ulla-May is from the mystical land of Sweden and is equally as unique in her artistry. She frequently shares her process in the Tutorials on the aA Blog. Her style inspires to transcend the lines between scrapbooking and digital artistry. MultiMedia Suns No. 3 – Love these because of their versatility as they come in PSD files. Spackle Textured No. 3 – These textures are fabulous and so fun to use. SnapShot No. 1 – I love these camera brushes because of their versatility and they can be used in all kind of layouts. ArtPlay Palette Poppy – Love the black/white/red colors and this ArtPlay is just amazing in every way. 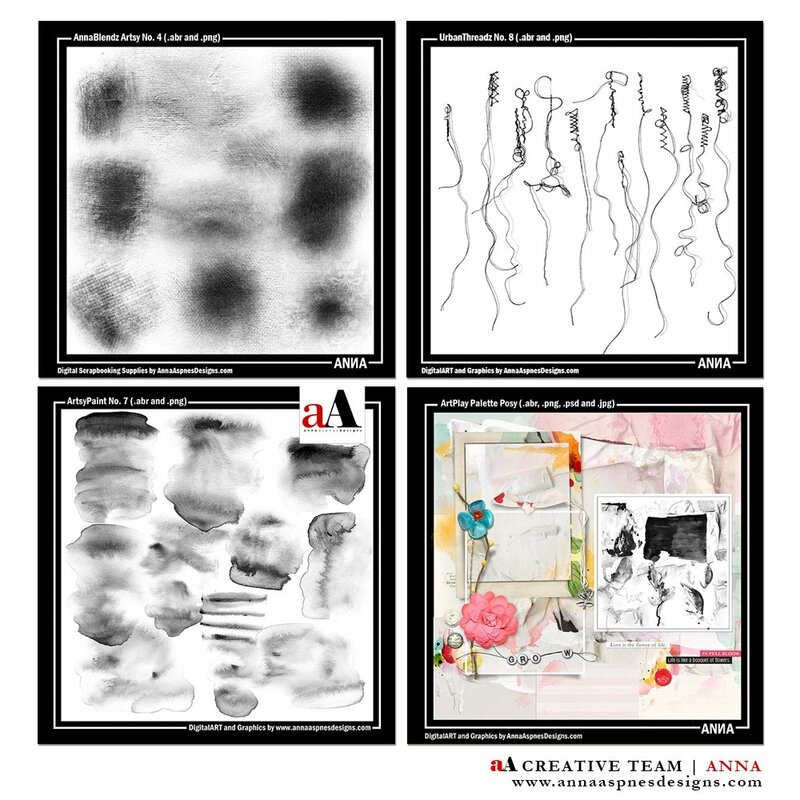 Designs and creates DigitalART and education at Anna Aspnes Designs. I create both digital artistry and scrapbooking layouts. The best way to see my latest work is to sign up for the weekly AnnaNews on the homepage and join the FotoInspired Facebook Group. AnnaBlendz Artsy No. 4 – If you have taken any of my classes, you will know these are my all-time favorite brushes for blending. UrbanThreadz No. 8 – UrbanThreadz and Stitchez feature on ALL my pages. This set tops my list. ArtsyPaint No. 7 – My favorite set of the series, the brushes of which are integral to the blending approach I have been sharing in Year of ArtPlay 2017. ArtPlay Palette Posy – As see here on my website. ArtPlay Palette Explore is probably my most used Palette because of the colors, but Posy features the infamous ArtsyFlowers. This post concludes our DigitalART Favorites series. Found aA DigitalART Favorites 7/7 interesting or useful?